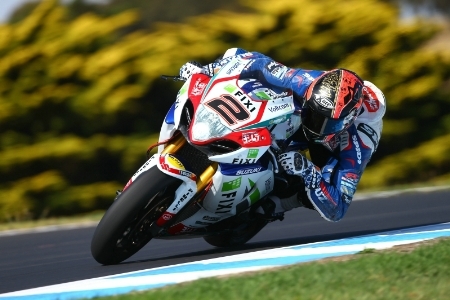 Fixi Crescent Suzuki rider Leon Camier maintained his scorching pre-season form at the first official World Superbike test at Philip Island today. In the searing Australian heat, he set a fastest time of 1.31.243 which is half a second under Max Biaggi’s lap record. Following a monster crash in last weeks test, the 26 year old used the morning to weigh up the Suzuki-GSXR. By the afternoon, he had completed 44 laps of the circuit and topped the timing sheets. Similar to Camier his teammate Julez Cluzel had a steady start to the day, regaining confidence in himself and the machine after a crash in last weeks test left him needing an operation. The Frenchman completed 62 laps of the legendary circuit, and finished 12th on the timing sheets, just a second and a half behind his teammate. Honda’s Leon Haslam finished just 0.5 seconds behind Camier, with Michel Fabrizio taking third position for the Red Devils Roma Aprilia team. Factory Aprilia rider Eugene Laverty wasn’t far behind with 1.31.452, and Marco Melandri rounded out the top five. Ducati rider Carlos Checa set the sixth fastest time, ahead of Davide Giugliano in seventh. Sylvain Guintoli finished just over 0.7 under Camier’s time ahead of his first season with Aprilia. Jonathon Rea wasn’t far behind Guintoli on his Honda, and Tom Sykes rounded out the top ten for Kawasaki Racing Team, setting a time of 1.32.061. The top seven riders all went fastest than Max Biaggi’s lap record, showing us how competitive this years World Superbike championship is going to be.